Majolica Majorca Rouge Majex Lipgloss is available in two limited edition shades (RD412 and RD311) for Holiday 2013. These glosses recently launched in Japan and are slowly becoming available online at a variety of shops. I had a friend of mine in Tokyo grab them for me but don’t worry I know Adam Beauty and Gooddealer will get them shortly as well! They are absolute must have for festive Holiday lip looks! 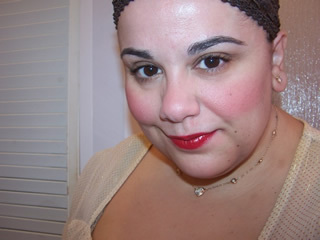 It’s been literally years since I tried out a Majolica Majorca Rouge Majex Lipgloss! Not since their original launch have I actually purchased a single shade but I was mildly curious when two beautiful reds popped up with the Holiday 2013 Collection. The MJ Pure Play Holiday 2013 Collection has a certain Snow White-like theme with bright white skin and blood red lips. These two Majolica Majorca Rouge Majex Lipgloss in RD412 and RD311 are the perfect shades of red to create not only festive Holiday looks but also for those that generally love lipglosses. I feel the formula has vastly improved on Rouge Majex Lipgloss as it was never this PIGMENTED! Both of these shades provide opaque color with a lovely glossy finish and a faint fruity flavor and fragrance. Color applies flawlessly and looks smooth, beautiful, and dramatic on lips. It wears for a solid four hours without migrating or feathering. The intensity of the shades lasts well into hour four so long as you aren’t eating or drinking. The formula isn’t tacky nor is it sticky and keeps lips pleasantly moist through the wear. I think the formula is fab but the shades are so dramatic and beautiful. RD412 is a blue based true red where as RD311 is a shimmering reddish raspberry! Both colors are very beautiful and dare I say deserving of backups! This are a smashing hit with me and gain a big Muse Approval. They should pop shortly at adambeauty.com as well as at golddealer.com and I imagine AlphabeautyUK on E-bay will also stock them! When they do I highly recommend grabbing them! I am in love with that blue based red. I really want these now… Which shade do you prefer Muse? For now I’ll have to limit myself to one >< since im eyeing that blue sparkly mascara. Hi Muse! Those colours really suit you! Temptinggg… 🙂 I’m guessing there was no discomfort whatsoever from the Rouge Majex? I was wondering if you have tried the Honey Pump Gloss from MM? Just got to try one just recently and found it to sting quite badly. Hope it’s not a regular thing since MM’s Rouge Majex looks great.